Even most casual college hoops fans are aware that Michigan State coach Tom Izzo has accomplished damn near everything a mortal -- as opposed to, say, John Wooden -- could possibly do. Or, as opposed to, say, Duke coach Mike Krzyzewski. Izzo says he's moved past that 1-11 mark against the Blue Devils, but the fact is still the same. Time to see if anything's changed. Bovada has set the line at Duke -2½, with the total at 149, and the moneyline at Michigan State +135 and Duke -155. Well, maybe Izzo actually is over his Dookie stigma. He believes this could well be one of his best teams ever at State, not necessarily in terms of all-around elite talent, but in chemistry. It's an intangible that could be a huge factor, as his players have whole-heartedly bought into their roles. It's paid off to date. Aaron Henry led Sparty's offense against LSU, racking up 20 points -- dude was 9-14 -- to go along with eight rebounds, six assists, a block, and a steal. It was his just third game of the season with double-digit points. State feels their defense can keep Duke close to them, so a consistent, grinding offense will be their strategy. Ironically, dudes have been cheating the devil for much of this tournament. They've survived last-minute scares against UCF and Virginia Tech. But they're still Dancing, and that's what counts. Zion Williamson and RJ Barrett have been good for 45.3 of Duke's average of 85.3 points per game. To date, their supporting cast has been up to the task of doing what's necessary to put the Blue Devils over the top game after game. This usually comes down to the decision PG Tre Jones makes, and he's delivered. Duke has covered the spread just once in its last eight games -- a 73-63 victory over Florida State in the ACC final when they were a 7-point favorite -- and never in the tournament. They've been doing just enough, which works for them but not the punters who back them. This game should be tight all the way, as one would expect at this stage of March Madness. 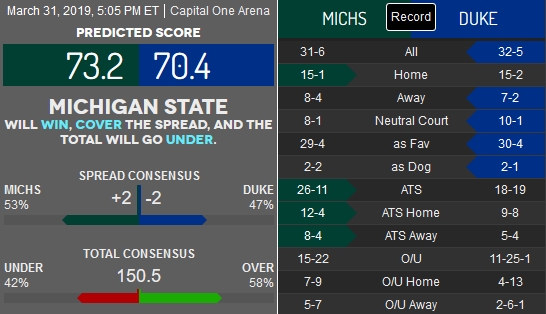 Thus, the underdog would be preferable as an ATS play ... if it wasn't for that Dookie hex on Sparty. Until it's interrupted again, that's a tough call. More likely is the notion that both teams are gonna go to stripped-down, defense-oriented tactics. That makes the under a better play.